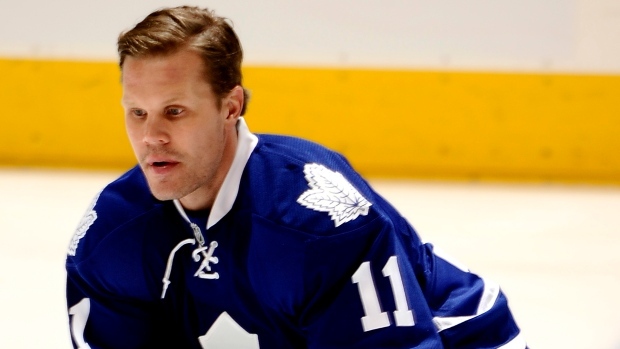 TORONTO - When Dave Nonis acquired Olli Jokinen from the Nashville Predators last month, the Toronto Maple Leafs GM promised the veteran forward he'd try to move him to a playoff contender before the NHL trade deadline. On Monday, Nonis lived up to his word, dealing Jokinen to the St. Louis Blues for forward Joakim Lindstrom and a conditional 2016 sixth-round draft pick. "We asked him to come here and play as hard as he could to put himself in a spot where teams would look at him favourably and he did that," Nonis said told reporters at the Air Canada Centre following the deadline. "I think he's excited to go there . . . and have a chance to win the Cup. "That's a very good team he went to." Toronto acquired Jokinen, prospect Brendan Leipsic and a 2015 first-round pick from Nashville on Feb. 15 for defenceman Cody Franson and forward Mike Santorelli. Jokinen, 36, had one assist in six games with the Leafs. St. Louis becomes Jokinen's 10th NHL stop, having also played previously with Los Angeles, the New York Islanders, Florida, Arizona, Calgary, New York Rangers and Winnipeg. But the six-foot-two, 210-pound Jokinen, scheduled to become an unrestricted free agent at season's end, has made just six career playoff appearances. Lindstrom, 31, had three goals and three assists in 34 games with St. Louis and is also slated to become an unrestricted free agent. Toronto also sent defenceman Korbinian Holzer to Anaheim for defenceman Eric Brewer and a '16 fifth-round draft pick. Ducks GM Bob Murray said Holzer, 27, is recovering from a broken nose and won't immediately be available. Holzer had six assists in 34 games this season with Toronto. He and Brewer will become unrestricted free agents at season's end. It seemed the Leafs were poised to make a much bigger deal Monday amid reports they spoke with Detroit about captain Dion Phaneuf before talks broke down. "We did as much as we could," Nonis said. "We hoped there was a couple of other things we could've got done, but we're pretty confident and happy with what we did get accomplished the last two, three weeks, no question." With the Leafs recent struggles — they've won just six of their last 32 games and are 14 points behind eighth-place Boston in the Eastern Conference standings — Nonis had been busy with seven separate deals prior to the deadline. And although such veterans as Phaneuf and forwards Tyler Bozak, Joffrey Lupul and Phil Kessel will remain in Toronto for the remainder of the season, Nonis said the Leafs will remain open-minded about making trades this summer. "I think bigger contracts generally move in the off-season," Nonis said. "But again we're going to move players based on our ability to make our team better. "It's not a fire sale. . . . We didn't go out and try to move a bunch of people (Monday). All we did is say we were open for business to see if there are fits to make us better. We're in a spot now where we're willing to look at options but we're not trying to push people out." Nonis said Toronto has assets other teams covet. "The notion the players we have here aren't quality players or aren't players that are wanted or desired by other teams is nonsense," he said. "Could we see a number of these players back? No question. "Would we move some of them if we get better and we accomplish some of our goals moving forward? Yes but again it's not a situation where everyone has to go and there's not a time frame or date that things have to be completed by." And although Toronto's playoff aspirations have faded, Nonis said the club has much to play over the remainder of the season. "I think you want your young players to grow and continue to be put in situations where they can improve," he said. "And you want your veteran players to take this seriously. "The record is going to be what it is but we want (veterans) to play as hard as they can regardless of the situation we put them in. It might be a different stretch run for some of them but we want them to act professionally and to finish the season as professionals."